Application for the MSN Program are due April 1. Applications to MU Graduate Studies are due at least 10 business days prior to the school’s application deadline. The online Masters of Science (MS(N)) program prepares graduates to fulfill and excel in advanced nursing practice roles requiring advanced skills in clinical practice, nursing education and/or leadership in delivery of health care to individuals, communities and populations. Baccalaureate degree nursing from a program accredited by a national organization responsible for nursing accreditation (i.e. Accreditation Commission for Education in Nursing (ACEN), National League for Nursing Accrediting Commission (NLNAC) or Commission on Collegiate Nursing Education (CCNE) or related field for DNP Leadership students and must be from a regionally accredited program from the Higher Learning Commission. A minimum GPA of 3.0 for the last 60 credit hours of the baccalaureate program. Successful completion of a graduate-level statistics course. A personal interview, upon request. Baccalaureate or master degree in nursing from a program accredited by a national organization responsible for nursing accreditation (i.e. Accreditation Commission for Education in Nursing (ACEN), National League for Nursing Accrediting Commission (NLNAC) or Commission on Collegiate Nursing Education (CCNE) or related field for DNP Leadership students and must be from a regionally accredited program from the Higher Learning Commission. 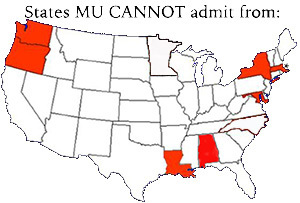 Due to higher education regulation changes, the University of Missouri is unable to accept applications for admission to online programs from students residing in several states (highlighted below). See the State Authorization for Distance Education page at Mizzou Online to learn more. Non-native English speaking applicants need documentation of English-language proficiency, demonstrated through a satisfactory Test of English as a Foreign Language (TOEFL) or International English Language Testing System (IELTS) score within the last two years. Our minimum TOEFL score requirement for the school of nursing is 600 (paper-based test), 250 (computer-based test) or 100 (Internet-based test) with no part score below 15. The minimum total academic IELTS score for graduate admission to MU is 7.0 (overall) and 6.0 (minimum bandwidth). Find out more about the English Language Requirements at the Mizzou Admissions office. International students must submit a photocopy of a current RN license from their home country with their Masters application. International nurses must obtain a Missouri RN license prior to beginning coursework. In order to obtain a Missouri RN license, the applicant will need to pass the Commission on Graduates of Foreign Nursing Schools (CGFNS) exam and the NCLEX exam. Applicants are encouraged to take the CGFNS exam in their home country. For more information, contact the Missouri State Board of Nursing at: http://pr.mo.gov/nursing.asp or by telephone (573) 751-0681. To apply to our MS(N) program, submit all materials electronically, as part of your online application. Following is a checklist of all the required materials and instructions for your application. Note: Applications to MU Graduate Studies are due at least 10 business days prior to the school’s application deadline. Deadline is April 1. Early application deadline is November 1. Apply for admission to the university and submit application to MU Graduate Students / MU Sinclair School of Nursing. To apply, visit the University of Missouri Graduate Studies Application. Upload unofficial copies of all transcripts, especially those documenting a baccalaureate or previous Master’s degree from a program accredited by a national organization responsible for accreditation (i.e. Accreditation Commission for Education in Nursing (ACEN), National League for Nursing Accrediting Commission (NLNAC) or Commission on Collegiate Nursing Education (CCNE)). The previous degree must be accredited by the regional accreditation: The Higher Learning Commission. Instruction for current and former MU students to request unofficial transcripts are available at from the Graduate Studies office. Click the “Recommendation Provider List” button on the recommendation request page within the MU Graduate Studies Application. Once the recommendation provider information is saved, and email will be sent to the recommendation provider with an access code and instructions on how to proceed with the online recommendation. When the recommendation provider submits the form to the graduate studies office it will become a part of your application. Applicants can view the status of online recommendations by logging into their application account.